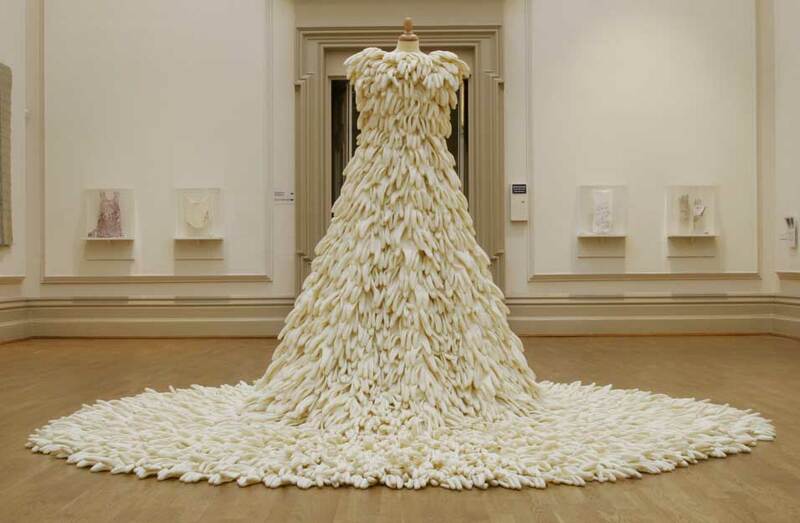 Susie MacMurray, British, born 1959, A Mixture of Frailties, 2004, Latex washing up gloves, calico and tailor's dummy. 72 3/4 x diameter: 128in. (184.8 x diam: 325.1cm). Collection of the artist. Photographer: Susie MacMurray. NEW YORK.- The Museum of Arts & Design will inaugurate its new home at Columbus Circle with Second Lives: Remixing the Ordinary, a special thematic exhibition featuring 40 contemporary artists from 17 countries who transform discarded, commonplace, or valueless objects into extraordinary works of art. On view from September 2008 through March 2009, Second Lives includes new commissions and site-specific installations, created from gun triggers, spools of thread, tires, hypodermic needles, dog tags, old eyeglasses, and telephone books, among other manufactured and mass-produced objects. Highlighting the creative processes that repurpose these objects, the exhibition explores the transformation of the ordinary into the extraordinary and stimulates debate on function, value, and identity. Organized by Chief Curator David Revere McFadden and Curator Lowery Stokes Sims, Second Lives reflects a current interest among international artists in using ordinary objects as raw materials, an approach rooted in both Dada and Surrealism. The works on view bear implicit social commentaries and explore themes of power, politics, identity, and value. Moreover, each work remains faithful to the traditional standards of craftsmanship, seen in processes that include carving, cabinetmaking, appliqué, and collage.  Colored Vases (2006), by Chinese artist Ai Weiwei, which directly confronts questions of value by repainting Neolithic Chinese vases with cheap, brightly colored paint. Weiwei obliterates the perceived value of these objects as ancient artifacts while simultaneously returning the vase to its original commonplace function as an everyday mass-produced vessel.  Brave #2 (2006) by American artist Boris Bally, which presents an intricate necklace made entirely of pistol triggers, delicately incised with hatch marks to give the finger a better grip. Bally, who has long been involved with violence prevention programs, obtained the triggers from weapons turned in as part of a Pittsburgh-based gun buy-back program.  Madame C. J. Walker, by U.S. artist Sonya Clark, is an 11-foot high portrait of Walker (1867-1919), the first African-American millionaire, whose fortune was made from developing and marketing hair products and cosmetics for African American women. Clarks imposing portrait is constructed of thousands of black hair combs, which create a pixilated image of the famous woman.  Ghana-born and Nigeria-based artist El Anatsui will create a new, site-specific work for the exhibition, a rich, shimmering tapestry made entirely and unexpectedly of foil from liquor bottles. Anatsuis tapestries speak to issues relating to the African slave trade, when liquor was used as payment for slaves, and to questions of sustainability that are challenging Nigerias rapid population growth. His work also reflects traditional Kente craft and weaving.  Trinity: Grandma, Spike, Bubbles (2007) by American artists Andy Diaz Hope and Laurel Roth. These custom chromed chandeliers are designed in traditional neoclassical form, but are made of hypodermic needles, gelatin capsules and Swarovski crystal which reflect drug culture themes. While seductive in their beauty, the chandeliers are a chilling reminder of a darker side of contemporary life.  American artist Jim Rose creates meticulously proportioned and finished pieces of Shaker style furniture, made entirely from abandoned steel found in automobile junkyards. Plain rust-patinated steel is used for the structures, while multi-color inset panels are fitted into the frame in their found state.  Fred Wilsons Untitled table top installation features a potpourri of white ceramic chotchkes and vessels used in everyday life which surround a large plaster reproduction of a classical sculpture. Set against this pervasive whiteness, a mammy-headed cookie jar sparks a conversation about race, colonialism, and cultural hierarchy which have been the fodder of art discourse since the 1980s. As the centerpiece of the museums inaugural exhibition program, Second Lives will be presented in MADs new special exhibition galleries on the fourth and fifth floors of its home at Columbus Circle. Also on view will be two permanent collection exhibitions, showcasing the most significant masterpieces from MADs distinguished holdings of more than 2,000 objects. Second Lives will be accompanied by a 200-page, fully illustrated catalogue, which will include essays by MAD curators David Revere McFadden and Lowery Stokes Sims, and an introduction by Director Holly Hotchner. Individual biographical and critical essays on each of the 40 artists in the exhibition will be accompanied by full-color illustrations of their work. The catalogue is being designed by Pentagram design, and will be available through the Museum Store. The Education Department is creating a series of public and educational programs designed to appeal to widely varying audiences, encompassing artists demonstrations in the museums open studios, as well as performances, workshops and lectures in the museums new galleries, education center and auditorium. In February 2009, the museum will host a symposium exploring the materials, processes and concepts behind the work of the artists in Second Lives. This day-long inquiry will focus on how artists blend an implicit ethos of sustainability with artistic innovation, and how timeless themes such as virtuosity, functionality, value, and identity are expressed through these very contemporary works. Second Lives: Remixing the Ordinary is organized by Chief Curator David McFadden and Curator Lowery Stokes Sims at the Museum of Arts & Design. The exhibition installation will be realized in the museums new special exhibition galleries by Exhibitions curator Dorothy Twining Globus, working with architect Todd Zwigard.